These local rules are important. They must be followed. Local rules cover issues of the practice before the courts in the county or judicial district where the local rules apply and encompass everything from a judicial assignment, disclosures of certain information, and mandatory processes like mediation and conferences. To put it into perspective, in 1994 there were only two courtrooms devoted to family law cases in Wake County. They were on the 8th floor of the courthouse, courtroom 8B and 8C. 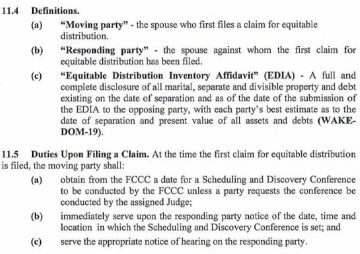 In 2018 there are four running at any given time and another courtroom where the only cases are domestic violence cases filed under Chapter 50B and C.
In 1994 you set a case on the calendar by putting a sticky note in the clerk’s notebook Now there is a procedure to get a case set that is an order of magnitude more complex than that. Along with the increase in population of Wake County there has been a marked increase in the number of pro se litigants. For purposes of this book, Wake County Local Rules will be referred to as “WCLR” or just “Rule” followed by the rule number. Don’t confuse this with the Rules of Civil Procedure or Rules of Evidence, again, these are local rules. The current revision to the Wake County rules is 2013; however, be advised that these will be updated in the future and you should check for any updates and not rely solely on this book to guide you. I am not going to go through, as of the time of this writing, all fifty seven pages of Wake County Rules, but you should have an understanding of where certain content is and the big picture. Rule 1.1 sets out the purpose of the rules as providing for the “fair, just, and prompt resolution of domestic cases in Wake County.” 1.1 makes it clear that if there is a conflict between the Rules and established North Carolina law (e.g., Rules of Civil Procedure, Rules of Evidence, North Carolina General Statutes, and case law) the presiding Judge shall resolve the conflict. To put it another way, if you represent yourself you are held to the same standards as a lawyer. Not knowing the law or knowing the rules will not be an excuse. Rule 2 and its subparts set out the rules about judge assignments in cases and the coversheets that must be filed with the litigation. Rule 2.4 excludes certain kinds of cases from judicial assignment. In Wake County, a judge will be randomly assigned in your case. It is not possible to pick your judge in Wake County. Rule 3 deals with calendaring of cases. Because Wake County courts are so busy, the process of scheduling cases is fraught with challenges. There is a website where you can go and see the court calendar at http://www.wcfcc.com/ Importantly, note how very busy the courts are and how some dates are marked “Closed” and some are marked “Open.” Typically, hearings may only be added to open days. The further you look into the future on the calendar, the more open and better settings you will see. Everyone wants their case heard as soon as possible, but don’t make the mistake of adding a case to a calendar just because it is open without evaluating the number of cases before yours. Rule 4 further explains setting in the various courtrooms and explains how the calendar call is to work. Rule 4.5 makes appearance by pro se litigants mandatory. Rule 5 covers motion practice in the family courts. This rule explains the procedure for contempt motions,, emergency motions and hearings. Rule 6 applies to child support cases and, this is very important, provides reference to Rul 10 and the necessary disclosures that must be made in child support cases. This is a key element of the Wake County Rules… they impose a requirement that for certain kinds of cases you should provide documents without being asked by the other party to do so. Failure to make your closures could result in case delays or sanctions. Rule 7 applies to custody matters in Wake County. Be aware that there are two kinds of custody cases: temporary child custody hearings and permanent custody hearings. Temporary child custody is limited to two hours of court time. Permanent custody hearings do not have that kind of limitation. Temporary child custody hearings are set administratively when there is a temporary child custody claim made by a party. temporary hearings and “permanent” hearings. Rule 8 explains the custody mediation process in Wake County. Wake County has a professional staff of mediators in the courthouse who mediate custody claims between parents. Lawyers are not involved in these mediations. Special rules apply to the scheduling of mediation and how mediation attendance is waived in certain cases. Be aware that what happens at mediation may not be brought up in your temporary child custody or permanent custody hearing. In other words, you can’t tell the judge what the offers were at mediation or that you believe the other side was unreasonable at the mandatory mediation session. Rule 9 covers postseparation support and alimony local procedure. Again, the focus on this rule is the mandatory disclosures of Rule 10 and that postseparation support hearings are administratively set. Rule 10 details the document disclosure requirements in child support, postseparation support, and alimony cases. It is a complex rule and detailed. Be aware, as in many of the other rules, there is a filing called for on the local rule form. In this case it is the certification of initial disclosures for support form that must be filed. Rule 11… welcome to the complex world of equitable distribution. No area of local practice is more fraught with landmines than the equitable distribution. That’s because equitable distribution is complicated and time-consuming, especially in cases where there might be business interest, intellectual property, real property and retirement to divide. 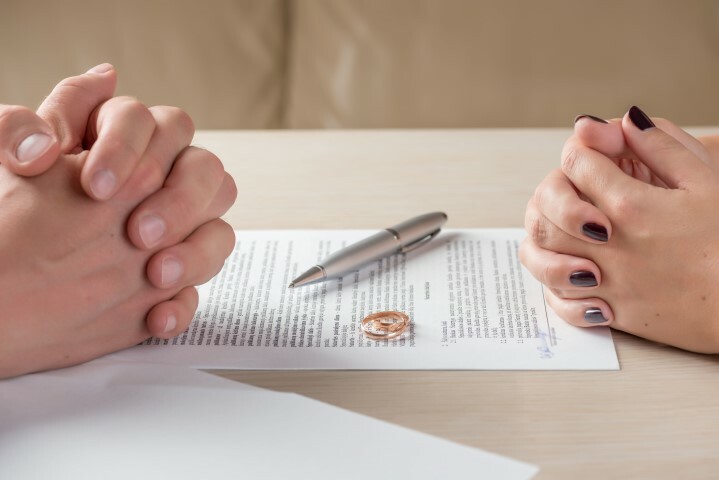 As in child support, postseparation support, and alimony, there are mandatory disclosures to make and required filings. Also, there are a series of pre-trial hearings that requires orders and scheduling. To give you a sense of the complexity, I have included Rules 11.4 and 11.5. If you open up the Rules and turn to 11.6 you will see about two pages where a single-spaced list of documents is detailed that you have to turn over. On top of the document requirements, there are inventory affidavit rules that you must comply with. Rule 12 is where the local rules mandate alternative dispute resolution. This is typically in the form of mediation in financial matters. In a subsequent chapter we will cover ADR. Rule 13 covers arbitration, parent coordinators and collaborative law. Rule 14 covers the local rules on motions to continue. Rule 15 explains how one goes about requesting a peremptory setting. Peremptory settings are special settings whether a case will take priority during the time allotted. This is especially useful in cases where one party has to travel long distances for the hearing or trial. Rules 16 and 17 explains how settlements are entered by the court. Rule 20 explains how you get an audio recording of proceedings (In Wake County District Court, all proceedings of record are recorded). Rule 21 explains how subpoenas are handled. This section is especially instructive for pro se litigants.